The Los Angeles-based Electric Prunes will always be best remembered for ‘I Had Too Much To Dream Last Night’ but, like many of the groups profiled here, were so much more than a one-hit wonder. ‘Get Me To World On Time’, ‘Are You Lovin’ Me More’, ‘Ain’t It Hard’ and ‘Shadows’ are all excellent songs that solidify the Prunes well-earned legendary status amongst fans of ‘60s garage rock. They’re also one of the few groups that made this list that are still actively recording in 2012. Talk about your bands with a cult following ... Love hit The Billboard Hot 100 Singles Chart three times. Their biggest hit was "7 And 7 Is", which climbed to #33 in 1966. Another Los Angeles-based group, Love was at one time among the kings of the almighty Sunset Strip. Every group of the era that played the Strip — including the Byrds, Turtles, Buffalo Springfield and the Doors — looked up to Arthur Lee’s combo. Their biggest hit, a cover of Burt Bacharach’s ‘My Little Red Book’, only hinted at what was to come. Their first album, Love, is in my opinion in the running with Rubber Soul as the greatest album ever recorded, while Da Capo and (especially) Forever Changes get the nod from just about every rock critic that knows his / her salt. Chicagoland DeeJay Bob Stroud (Rock And Roll Roots) once told me that he believed Love was one of the most under-rated and under-appreciated rock acts of all time. They certainly were an acquired taste. Much as I've tried to find an appreciation for their music, they've just never clicked with me. However, from what I've heard, Love was a "band's band" ... other artists like The Doors looked up to Love as role models of what they themselves might aspire to ... and would catch their live appearances whenever they could. The Countdown Continues ... Today in Forgotten Hits! One of my favorite groups from the mid-'60's, The Five Americans could seem to do no wrong for a while there, scoring five straight hits in 1966 and 1967. ‘Western Union’ and the follow-up ‘Zip Code’, the Five Americans’ greatest hits, are much more pop than garage but don’t in any way diminish their standing with garage rock fans and collectors. One listen to ‘I See The Light’ clearly demonstrates why. The Durant, Oklahoma, group recorded several excellent songs, including ‘Evol Not Love’ and ‘Good Times’. Talk about bridging the generation gap ... in 1967, The Five Americans paid tribute to an older form of mail communication (with "Western Union") as well as the latest in postal technology, "Zip Code"!!! The Five Americans first met in Durant, Oklahoma, at Southeastern Oklahoma State University in 1962. Under the leadership of Mike Rabon, they formed a group called the Mutineers. They played local beer joints and various frat dances until the summer of 1964. Mike suggested that they go to Dallas and try and make enough money to pay for tuition for the following fall semester. They achieved some local notoriety in a dive called the Pirate's Nook. There they were "discovered" by a local label called Abnak Records. John Abdnor, president of the label, took them under his wing and provided them the resources to write and practice original songs. In only five short years, The Five Americans were the first to achieve what no other group in Texas had done -- sell millions of singles and albums. Now THESE guys are from Texas for sure!!! "Wooly Bully", their first chart hit, was a monster ... although it never officially hit #1 in Billboard, the magazine declared it the biggest song of 1965, ranking it ahead of rock and roll classics like "Satisfaction" by The Rolling Stones, "Help!" and "Ticket To Ride" by The Beatles ... and pop royalty like "You've Lost That Lovin' Feelin'" by The Righteous Brothers and "Downtown" by Petula Clark ... Motown gems like "I Can't Help Myself" by The Four Tops and "My Girl" by The Temptations ... ALL of which were #1 Records, as were "Help Me Rhonda" by The Beach Boys, "I Got You Babe" by Sonny and Cher, "Mr. Tambourine Man" by The Byrds, "This Diamond Ring" by Gary Lewis and the Playboys and "Mrs. Brown, You've Got A Lovely Daughter" by Herman's Hermits. Sam The Sham (real name Domingo Samudio) would hit the top spot with "Li'l Red Riding Hood" the following year (in Cash Box ... it, too, peaked at #2 in Billboard), and also scored Top 40 Hits with "Ju Ju Hand", "Ring Dang Doo", "The Hair On My Chinny Chin Chin" and "How Do You Catch A Girl". If they had recorded only ‘Wooly Bully’, Sam The Sham And The Pharaohs would still no doubt place highly in any list documenting the top garage bands of the 1960s. Today they are remembered for a string of songs that all scream “Sam The Sham”—‘Ju Ju Hand’, ‘Ring Dang Do’, ‘Little Red Ridin’ Hood’, ‘The Hair On My Chinny Chin Chin’, ‘I Couldn’t Spell !! @!’ and ‘Oh That’s Good, No That’s Bad’. None are 100% garage rock, but all are solid examples of ‘60s pop-rock at its most enjoyable. Everybody knows the group’s signature tune, and the “Uno, Dos, Tres…” opening immediately plants ‘Wooly Bully’ as among the most instantly recognizable songs ever recorded. Some consider "Wooly Bully" to be the #1 Party Rock Song of All-Time. Every new generation to come along has discovered it and fallen in love with it as a feel-good anthem. Here's yet another group that I wouldn't necessarily have considered to be of the "garage band variety" ... but you guys clearly felt otherwise, voting Chicago's Buckinghams into the #15 spot in our countdown. While I suppose they started out that way ... I mean, who didn't?!?! ... The Bucks developed a very sophisticated sound in the '60's, crafting pop classics like "Kind Of A Drag", "Don't You Care" and "Hey Baby, They're Playing Our Song" that still sound every bit as fresh today. They also showed their R&B roots with a very soulful, Top Five reading of "Mercy Mercy Mercy" as well as dabbled with the new psychedelic musical art form by way of "Susan". I don't know about you, but I didn't see too many horns in the garages I was hanging out in in the mid-'60's, but The Buckinghams developed a sound that was the precursor to artists like Chicago and Blood, Sweat and Tears. Meanwhile, former lead singer Dennis Tufano is also back on the road again, singing the hits that made him famous and has appeared on several of those PBS Television Tributes to the '60's. The first of a string of Chicago-based groups that hit the big-time by utilizing horns, the Buckinghams were, in 1967, as popular a group as rock history has ever seen. They achieved five Top 20 hits that year alone, and appeared on every TV music show possible — including The Ed Sullivan Show. Not one of those smash songs (‘Kind Of A Drag’, ‘Don’t You Care’, ‘Mercy Mercy Mercy’, ‘Hey Baby [They’re Playing Our Song]’ and ‘Susan’) can today be classified as garage rock, but their early single cover of James Brown’s ‘I’ll Go Crazy’ certainly comes close. OMG, they're barely out of diapers!!! (lol) Check out those pompadours!!! And look at the company they kept on this program in the way of vocal entertainment! Heavy emphasis on The Beatles in that vintage clip ... The Bucks would go on to record a couple of Beatles tunes for real ... "I Call Your Name" appeared on their first USA album ... and a nice version of "I'll Be Back" was included on their 1967 LP, "Time And Charges". The Countdown Of Your Top 20 All-Time Favorite Garage Bands Begins Today!!! 'Cause now the REAL Countdown begins!!! THE COUNTDOWN HAS OFFICIALLY BEGUN!!!! With 175 of your votes, The Trashmen kick off The Top 20. They were late-bloomers in this poll ... but once somebody said, "Hey, what about 'Surfin' Bird' and 'Bird Dance Beat' by The Trashmen? ", our readers immediately responded in kind. "Surfin' Bird" was the #4 Record in the country when Beatlemania hit by way of "I Want To Hold Your Hand" ... and (despite all things British going on at the time), it has remained a timeless classic ever since. Although they had recorded and released a folk-rock single as the Bloos Magoos, it wasn’t until the psychedelic sounding and looking Bronx-based Blues Magoos released ‘We Ain’t Got Nothing Yet’ that they dented the charts (Top 5 in U.S.). Their follow-up songs ‘There’s A Chance We Can Make It’ and ‘Pipe Dream” were much less successful, but how many other groups could get away with wearing electric suits on stage and promoting the “Psyche-de-Lite”, an early version of the lava lamp? For anybody wanting a definition of “psychedelic”, check out the band’s jaw-dropping performance of ‘Tobacco Road’ on The Kraft Music Hall! The Blues Magoos' rendition of "Tobacco Road" was a killer classic ... I remember my brother playing this one all the time around the house when we were growing up. Doug Sahm’s ‘60’s group, the Sir Douglas Quintet hailed from San Antonio. The first 1965 single, ‘She’s About A Mover’ is today classified as Tex-Mex but still falls nicely into the “garage rock” label. The Quintet’s first album also contained other garage rock-worthy songs, buy they’re probably best known for ‘Mendocino’, a pop song that graced the charts in 1968. The Music Machine’s ‘Talk Talk’ has to be the most powerful garage rock song to ever become a hit. The short but lethal tune introduced the world to Sean Bonniwell’s one glove wearing, black clad combo — and as a result probably scared more than a handful of people. The core members of the Los Angeles group — Ron Edgar, Keith Olsen, Mark Landon and Doug Rhodes — all ended up contributing mightily to rock and roll history. I won’t go into details here; look them up — you’ll be glad you did. Count Five is another artist that made our Top 20 All-Time Favorite Psychedelic Songs Countdown, thanks to their 1966 Top Five Hit "Psychotic Reaction." Although owing a great debt to the Yardbirds, the Count Five’s ‘Psychotic Reaction’ is a prime example of Garage Rock 101. The San Jose group quickly recorded an entire album after their classic song became a smash, but none of their other recordings came anywhere close to again gaining national prominence. With a song like ‘Psychotic Reaction’ as your signature tune, however … who cares? Lester Bangs further immortalized the Count Five in his 1972 book Psychotic Reaction and Carburetor Dung. Another San Jose group (the third, by my count, to make this list), the Syndicate Of Sound’s ‘Little Girl’ reached the Top 10 in 1966. They did release an album and three follow-up singles, but nothing that attained the heights of ‘Little Girl’. The rest of their recordings should not be overlooked, however. ‘Mary’, ‘Keep It Up’ and ‘Rumors’ are all excellent. While their other top hits, especially ‘With A Girl Like You’, ‘Anyway That You Want Me’ and ‘Love Is All Around’, might portray them in a different light, the Troggs will forever be immortalized by ‘Wild Thing’, a song they initially were hesitant to record due to its “groovy” lyrics. The Troggs have been cited as inspirations by many later garage rock / punk bands, with ‘I Can’t Control Myself’ and ‘I Want You’ being particularly influential. Often thought of as more a psychedelic group than a garage band, The 13th Floor Elevators only had one song that came close to being a hit — the screaming classic ‘You’re Gonna Miss Me’. While the Roky Erickson-led, electric-jug based group recorded four albums and released seven singles, it is ‘You’re Gonna Miss Me’ that they’ll most likely always be remembered for. 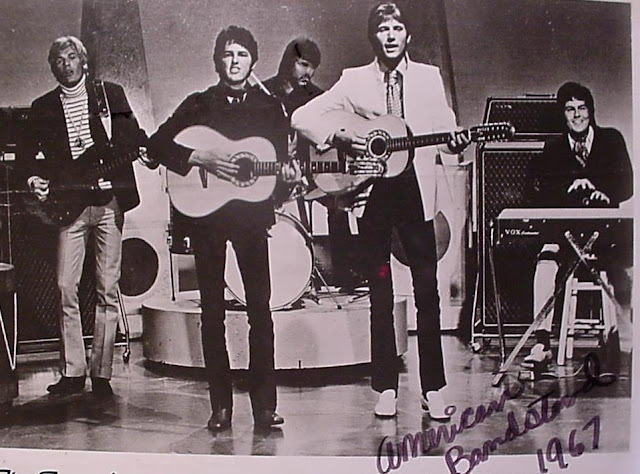 The Texas group performed the song on both American Bandstand and Where The Action is, influencing countless bands across the country along the way. ... EXCLUSIVELY in Forgotten HIts!!! The list continues today with five more "Runners Up"! Perhaps I’m going out on a limb when I unashamedly state that the Cryan’ Shames recorded the greatest song ever not to become a #1 smash. ‘It Could Be We’re In Love’ was far from a garage rock song, but ‘60’s pop doesn’t get any better. The group deserved far greater success than their excellent cover of ‘Sugar and Spice’ (and, to a lesser degree, Jim Fairs’ original ‘I Wanna Meet You’) afforded them. Chicago’s Shames could do it all, however, and ‘Ben Franklin’s Almanac’ is a fantastic representation of what garage rock is all about. If it wasn’t for their regular appearances on Where The Action Is and in the teen magazines of the day, Wisconsin’s Robbs would be probably completely forgotten today. After all, I have never heard a Robbs’ song on the radio, and I’ve been listening for over 35 years. What a shame. ‘Race With The Wind’, ‘Rapid Transit’ and ‘Bittersweet’ gained some chart recognition but deserved to be massive hits. Yes … they later recorded as Cherokee in the 1970s and opened Cherokee Studios in Los Angles, where many top acts recorded, but they accomplished enough as the Robbs to also be remembered for their ‘60s music. I don't know that I would have necessarily considered these guys in the Garage Band category ... surf rock maybe? Biker Rock? "Cycle-delic Rock"??? But they earned enough of your votes (117 as a matter of fact!) to land in one of the Runners' Up Positions. Probably better known for recording surf and “biker music” (for countless ‘60s exploitation flicks), Davie Allan & The Arrows are another of the handful of groups we’re profiling in this special countdown. The band had four national hits (and a few regional hits here and there.) ‘Apache ‘65’ achieved some local (California) success and resulted in a national TV appearance on Shindig!. Although many different musicians comprised The Arrows throughout the years, Drew Bennett and Russ Viot were mainstays, and made TV appearances with Allan on both Get Smart and The Invaders. Even though I had a few singles (the one hit was "Apache '65"), the major success of "The Arrows" came with the soundtrack work. There was only one official "Arrow" (besides me) early on and that was drummer Larry Brown. We did a short film titled "Skaterdater" with union musicians (Larry Knechtel, Joe Osborne, Al Casey and Jim Horn) that got the ball rolling for doing the soundtracks. The way the story goes is that Roger Corman saw "Skaterdater" and said something like" that's the sound I want for "The Wild Angels". I added the great Drew Bennett on bass plus Russ Viot on rhythm guitar replaced by Wayne Allwine (who became the 3rd official voice of "Mickey Mouse" in 1977). We did various trips and only one tour across the country (partly because we were recording almost everyday for about five years). Other notable soundtracks (of the two dozen or so) includes "Devil's Angels", "The Glory Stompers", "Born Losers" (that one introduced the character "Billy Jack"). Being called a "garage band" was ok. Later on my music was called "biker rock" and I've called it "melodic grunge" since the 90's. I still appear once in a while and since 2009 I've been recording my "Retrophonic" series. Volume 4 is due early in 2013 with new versions of "The Glory Stompers", "Ghost Riders in the Sky", "War Path" (it marks the first time I've re-recorded my first single) plus many new originals and cover tunes such as "Lullaby of the Leaves" and "Cara Mia". The countdown continues tomorrow in Forgotten Hits!